As promised, the cracked valley beam previously supported by a 2x4 and a couple nails is now supported by a huge block of steel and a 4x4. 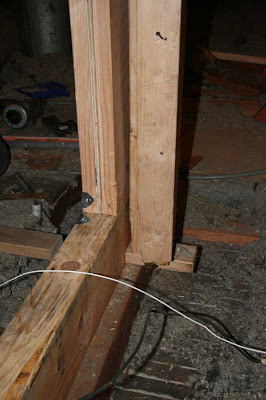 The beam itself is also sandwiched between two sheets of plywood (which is in turn sandwiched by the steel) so it should be good and strong now. Here's the other side. Steel, bolts, good stuff all around! Here is the 'other' valley beam on the other side of the house. That light spot is where the wood had been compressed from the previous brace (you guessed it, a 2x4 and a couple nails). This will now have a shiny new 4x4 brace (which John is holding in this picture). In addition, that big center column will be supporting a lot of the weight previously supported by this brace. Here we see the worst day of the job for John. 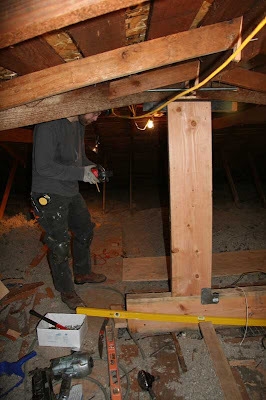 He is putting brackets at the base of all the rafters to better attach them to the walls. 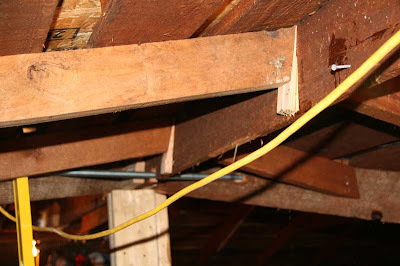 If you look closely, you can see the metal bracket on the rafter. One of those for every rafter in the house. Fun fun fun. And finally, here is what is NOT happening in my attic! 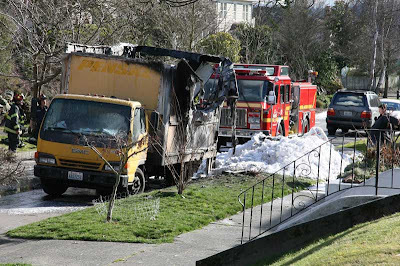 Up the street, someone else was having insulation blown into or sucked out of thier attic, and this happened: Yikes! Look closely here: The enourmous column behind the 2x6s and the enourmous hunk of wood (4x10 or 4x12) that they are sitting on is all new. So ignore that for now. Look just at the three 2x6s that are nailed together. They are sitting on a horizontal scrap of 2x4 which is floating off the edge of the base 2x4. What this means is that TWO-THIRDS of this old 'support column' was being supported by....AIR! Wow. Here we see the view from the other side. Again the big 4x10 base and the double 2x12 sandwich (on the left) just went in today! (They were going in as these pictures were taken, in fact!) Before that, it was just this floating column on the right that was holding things up. Here is a side view of the new double 2x12 plus plywood sandwich that will be holding my roof up from now on. 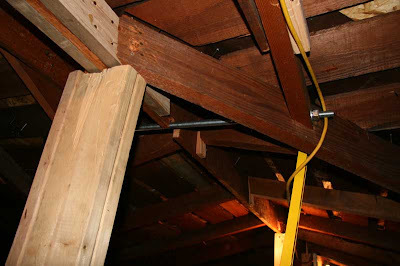 Note the tight fit and crazy angle of the metal/wood connection to make things strong. 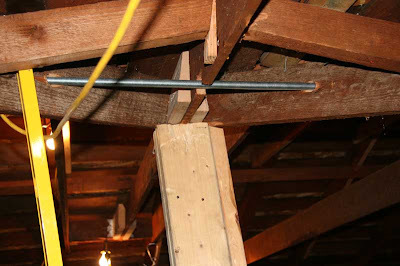 Yes, in this case, the crazy angle is a GOOD THING because it means that the straight and level new column fits tightly onto the old angled valley beams. That's some quality workmanship! And an overview of the new and improved center support column. Nice! 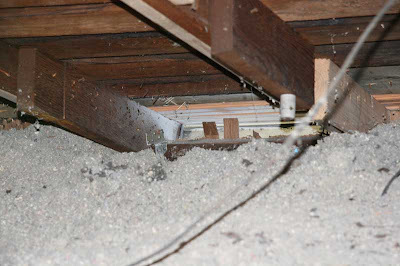 First, here is my attic. It's messy and gross, and generally not a fun place to be. This is John. 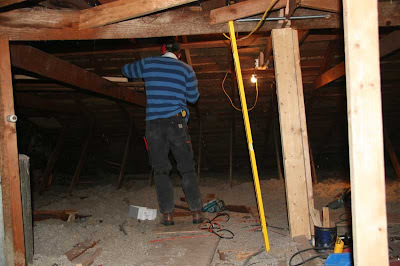 He gets paid 'the big bucks' to spend lots of time in my messy attic. He also gets to make it a much better attic which will be much (MUCH MUCH) less likely to fall down and me, Alice, or the rest of our house. 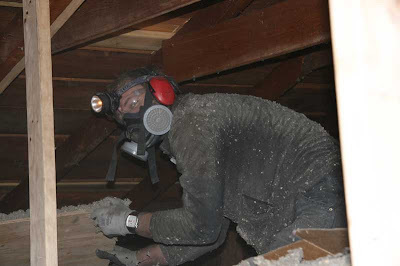 Thus keeping the attic where it belongs--out of sight and mind! John is also a pretty good poker player. Here is a fine example of some of the shimming that John gets to do. 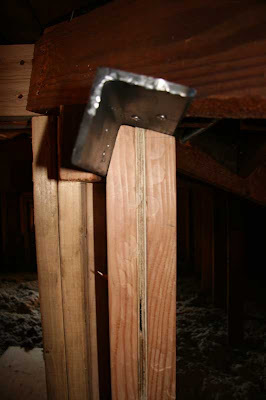 Notice the 1+ inch gap between the rafter and the ridge. 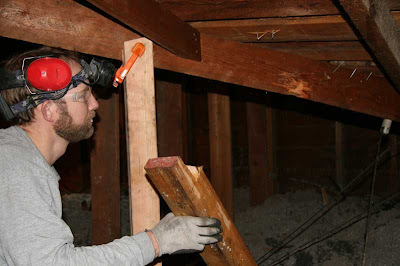 That is now filled--and then the 2nd rafter (behind) is added to further secure the connection. These are both good things! 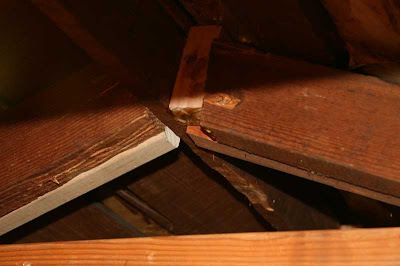 Here is the biggest single problem in the attic. 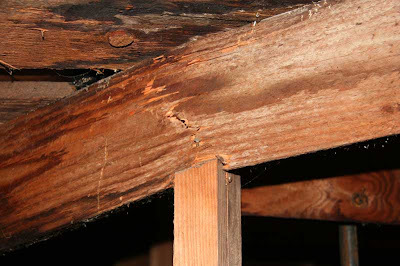 This is a "valley beam" which is cracked and currently supported by a single 2x4 and a couple of nails. In Part 2 you will see something better supporting this. Here we see some more shims and a shiny new big bolt holding things where they should be. The support column will be improved in Part 2. More shims and another look at the big bolt. And again... Notice how everything is touching now. 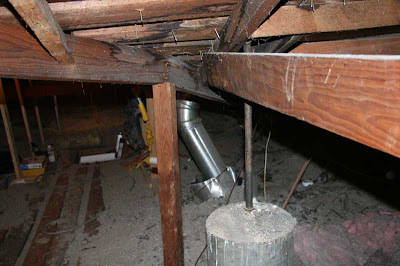 Like those angle (valley) beams are touching the ridge beam. It wasn't that way before. 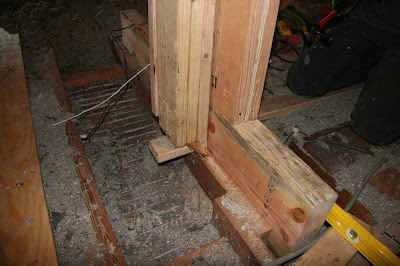 Another look at the cracked valley beam and 2x4 support column. 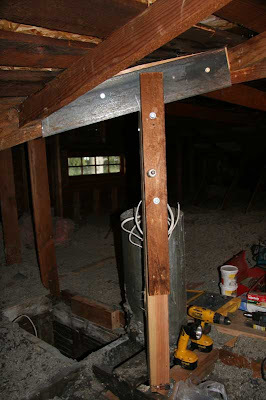 The next time you see this, there will be a big metal bracket on the valley beam with a 4x4 support column. That will be nice. Finally, this is the "Pit of Death." 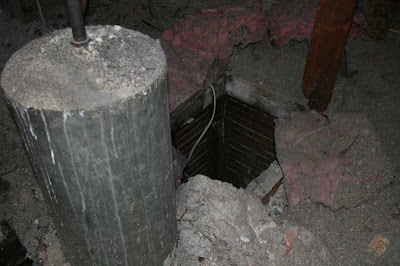 It has nothing to do with the attic structure, but I thought the world should know that my house has a "pit of death." This used to be a chimney, bit it is now a big hole where additional kitchen could have been. 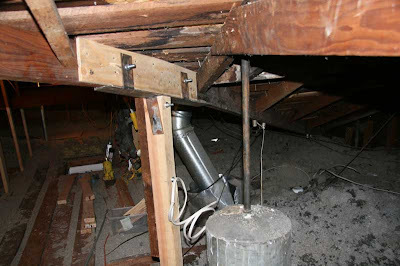 If one were to fall down this hole, they would go through the main floor entirely, then break the ceiling of the basement and land in the laundry room. The foreground is an old water tank--I think. And there you have it. 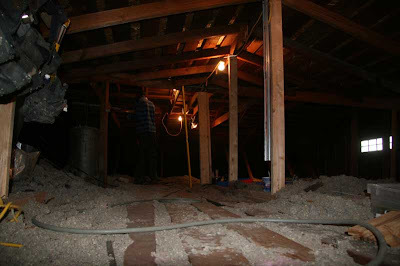 "What is happening in my attic" part 1. Hope you had fun.